Vancouver, B.C. – June 19, 2018 – TAG Oil Ltd. (TSX: TAO and OTCQX: TAOIF) confirms that ERC Equipoise Ltd. (“ERCE”), a qualified reserves evaluator in accordance with National Instrument 51-101 and the Canadian Oil and Gas Evaluation Handbook, has completed its independent reserves assessment on the Company’s producing oil and gas assets within the Cheal (PMP 38156), Cheal East (PEP 54877) and Sidewinder (PMP 53803) permits in New Zealand. This report is dated and is effective as at March 31, 2018. ERCE has assigned a pre-tax net present value of $97 million (FY2017: $82 million), using a 10% discount rate to the Company’s net working interest proven plus probable (“2P”) reserves. * The reserves and values are gross working interest and pre-tax. An approximate 8% decrease due to 351 Mboe produced over the 12-month period in fiscal year 2018. A significant reclassification from contingent resources to reserves was from the waterflood program at the Cheal East permit. Additional behind pipe pay opportunities have also been assigned reserves that were not previously included, such as the Cheal-B8 and E1 well re-completions in the Urenui formation. The technical volumes increased due to a revision on decline performance, which has improved in the Cheal-A3X, B6, B8, B10 and E2 wells, as well as the Sidewinder-1 and 2 wells. The technical volumes decreased due to revisions to the production profiles in the Cheal-BH1, B2 and B4ST wells. Also, the infill locations for the Cheal-BP and E9 wells were not included in this year’s development, as well as the Cheal-A10ST and A7 workover, which have been replaced (Cheal-A10 workover and A7 conversion to injector) as part of the waterflood expansion. Statements contained in this news release that are not historical facts are forward-looking statements that involve various risks and uncertainty affecting the business of TAG Oil. Such statements can generally, but not always, be identified by words such as “expects”, “plans”, “anticipates”, “intends”, “estimates”, “forecasts”, “schedules”, “prepares”, “potential” and similar expressions, or that events or conditions “will”, “would”, “may”, “could” or “should” occur. All estimates and statements that describe the Company’s plans relating to the Dividend and Coronado are forward-looking statements under applicable securities laws and necessarily involve risks and uncertainties. Actual results may vary materially from the information provided in this release, and there is no representation by TAG Oilthat the actual results realized in the future will be the same in whole or in part as those presented herein. Other factors that could cause actual results to differ from those contained in the forward-looking statements are also set forth in filings that TAG Oiland its independent evaluator have made, including TAG Oil’s most recently filed reports in Canada under National Instrument 51-101, which can be found under TAG Oil’s SEDAR profile at www.sedar.com. TAG Oilundertakes no obligation, except as otherwise required by law, to update these forward-looking statements in the event that management’s beliefs, estimates or opinions, or other factors change. Disclosure provided herein in respect of boe (barrels of oil equivalent) may be misleading, particularly if used in isolation. A boe conversion ratio of 6 Mcf:1bbl is based on an energy equivalency conversion method primarily applicable at the burner tip and does not represent a value equivalency at the wellhead. Reserves are estimated remaining quantities of oil and natural gas and related substances anticipated to be recoverable from known accumulations, as of a given date, based on analysis of drilling, geological, geophysical and engineering data, the use of established technology, and specified economic conditions, which are generally accepted as being reasonable, and shall be disclosed. Reserves are classified according to the degree of certainty associated with the estimates. Proved reserves are those reserves that can be estimated with a high degree of certainty to be recoverable. It is likely that the actual remaining quantities recovered will exceed the estimated proved reserves. Probable reserves are those additional reserves that are less certain to be recovered than proved reserves. It is equally likely that the actual remaining quantities recovered will be greater or less than the sum of the estimated proved plus probable reserves. Possible reserves are those additional reserves that are less certain to be recovered than probable reserves. It is unlikely that the actual remaining quantities recovered will exceed the sum of the estimated proved plus probable plus possible reserves. at least a 10 percent probability that the quantities actually recovered will equal or exceed the sum of the estimated proved plus probable plus possible reserves. The reserve estimates contained herein are estimates only and there is no guarantee that the estimated reserves or resources will be recovered. The estimates of reserves for individual properties may not reflect the same confidence level as estimates of reserves for all properties, due to the effects of aggregation. Where discussed herein “NPV 10%” represents the net present value (net of capital expenditures) of net income discounted at 10%, with net income reflecting the indicated oil, liquids and natural gas prices and initial production rate, less internal estimates of operating costs and royalties. 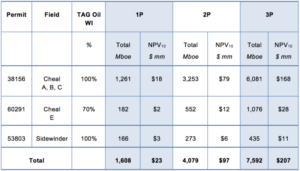 It should not be assumed that the future net revenues estimated by TAG Oil’s independent reserve evaluators represent the fair market value of the reserves, nor should it be assumed that TAG Oil’s internally estimated value of its undeveloped land holdings or any estimates referred to herein from third parties represent the fair market value of the lands.